The Lensic and The Santa Fe Opera are very happy to be able to team up with the Metropolitan Opera of New York on Saturday, Jan. 5, 2013 and offer Berlioz’s classic opera ‘Les Troyens’ to the opera lovers in Santa Fe during January, even though opera season is long over and won’t start back up again until the summer of July 2013. The Met offers a rare opportunity to witness Berlioz’s vast epic, last performed at the Met in 2003. Deborah Voigt, Susan Graham, Marcello Giordani, and Dwayne Croft lead the starry cast, portraying characters from the Trojan War. Met Principal Conductor Fabio Luisi marshals the large-scale musical forces. 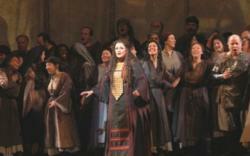 Both the Lensic and The Santa Fe Opera are featured businesses on SantaFe.com. Box office representatives are happy to assist you. The Lensic Performing Arts Center opened as a nonprofit in 2001 following the restoration of the Lensic Theater, a cornerstone of downtown Santa Fe since 1931. Serves as a national model for a sustainable arts center—with its focus on performance, education and community programs. Presents over 200 eclectic performances year-round, at affordable prices, delivering outstanding local, national and international talent. Enriches public education by bringing more than 10,000 school children to the theater annually to see free performances of music, storytelling and dance. Subsidizes local arts organizations, like the Santa Fe Concert Association, Santa Fe Symphony and Santa Fe Pro Musica by covering half of the rental fee for each group that uses the theater. Offers its facilities to local nonprofits for free, or at a nominal cost, helping more than 160 organizations raise $1.7 million over 10 years. Delivers best-in-class technical support capable of serving world-class organizations from traveling Broadway shows to the Moscow Ballet. Sponsors a technical internship and scholarship program to train Northern New Mexico high school students in theatrical arts. Serves as a home to the nonprofit Tickets Santa Fe, a community box office serving more than 35 organizations and venues. From the unlikeliest of beginnings—an opera company located hundreds of miles from any major city, featuring American singers in a wide-ranging and challenging repertory, and treating theatrical and musical values as equally important in its productions—The Santa Fe Opera has grown to become recognized as one of the world's leading cultural festivals.